Why was the famous picture of George Washington unfinished? 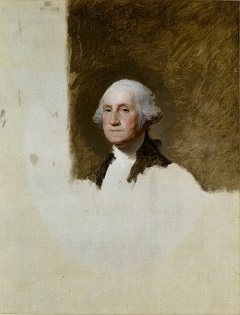 Q.Why was the famous picture of George Washington that can be found hanging in old school rooms unfinished? A.You are referring to the famous work by Gilbert Stuart, who painted several portaits of Washington, but ironically this unfinished work went on to become the most well known, forming the basis for the picture you can find on the dollar bill. This particular portrait had originally been commissioned by Martha Washington along with a companion portrait of herself to hang by its side. In the course of painting, George Washington passed away and the Martha portrait was never even begun.